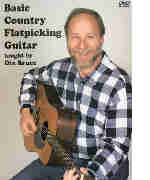 Dix Bruce carefully teaches lead and backup guitar to nine great and classic country, bluegrass, and folk standards, ballads and hot breakdowns played by musicians the world over. Dix demonstrates the basic "bass note/strum" technique and shows how melodies can be easily integrated into known chord patterns. You'll first learn leads on the country classics Worried Man Blues; Lonesome Valley; Storms are on the Ocean; and Handsome Molly in a variety of different keys. You'll also learn the all-time guitar hit Wildwood Flower and how to transpose it from the key of G to the key of C. Dix also demonstrates more complex leads on Redwing; John Hardy; Jimmie Brown the Newsboy; and more on the invaluable skill of transposing a song from one key to another. 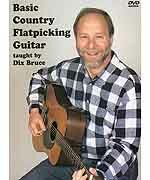 The instruction in this DVD will prepare you to play flatpicked leads in virtually any country, folk, and bluegrass ensemble. A detailed tab/music instructional booklet is included as a PDF file on the DVD.